I wanted to bring you to my friend Marti's front yard~it is downright beautiful. I featured her last fall, and I couldn't help but grab my camera and start taking pictures when I was there. She's not only a decorator, but a gardener as well, and so it makes for a killer combination. Her husband is in agriculture, so he gets to bring home some amazing pumpkins. Aren't these ones cool? I thought they were cement at first! Funny story with this one: Marti's husband Russ stuck a little pumpkin inside the planter as a joke to see if she would notice. She loved it so she just filled it up. Doesn't it look great? 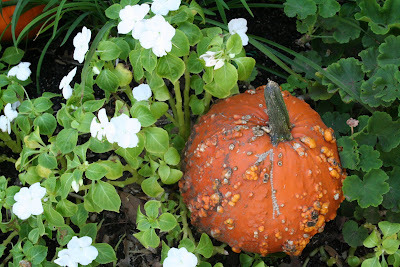 Thanks for letting me share your autumn goodness, Marti! I hope you all have a wonderful weekend~see you back here on Monday! 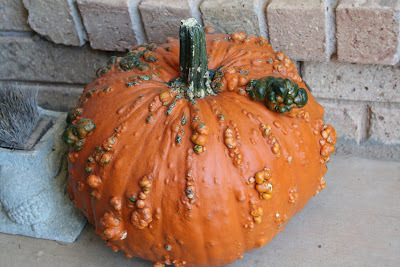 I'm loving all the pumpkins everywhere! I'm saving all my pumpkin money for our family trip to the patch...but I'm gettin' antsy and all these cute ideas aren't helping!!! She's got it all! And the pumpkins look fantastic. Like Carrie..., I'm saving my "pumpkin money", but since I have an orange room, it's not so bad. If I didn't love Marti, I would hate her. In a good way. Wow, what a BEAUTIFUL front yard. Shes go some skills. Thank you for sharing, you have great taste. 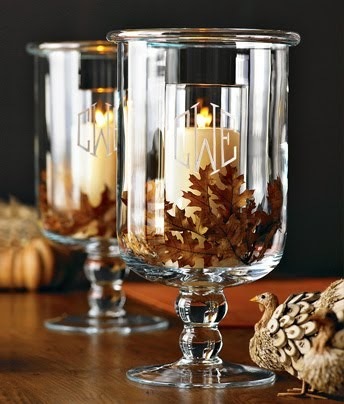 I'm also loving your autumn home decor. Wow! I love the ones she nestled into the garden ~ they look like they grew there. Love the little "striped" ones in the pot with the wire, too. Very pretty! 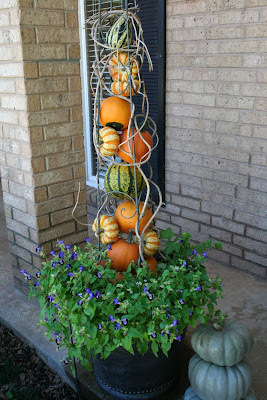 And what a great idea to put all those little pumpkins inside the topiary form. Thanks to you and your friend for sharing these pics! I love how there are pumpkins all throughout the yard instead of one place. This is such a good idea! I've never seen pumpkins displayed so creatively before. She did a spectacular job. Thanks for sharing it with us. 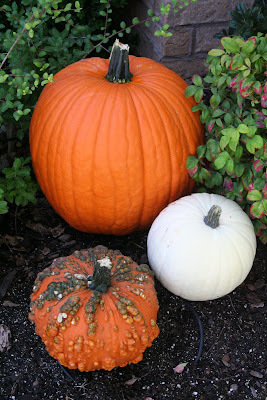 Gorgeous... pumpkins come in a fabulous variety of colors!! The blue gray ones are fantastic, her decorations are such fun! Wow! What a beautifully decorated yard!! It looks so pretty...she did a great job! 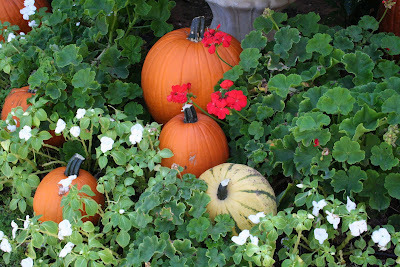 I love the pumpkins in the planters. I may have to borrow that idea. How gorgeous! 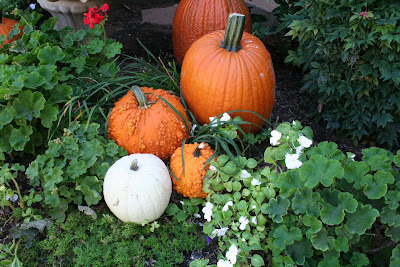 I love how all of the pumpkins make it look so cheerful and bright! Now that is a lot of fall decorating right there. Cool. I loved seeing these pics! You inspired me to go pumpkin shopping today! That is really gorgeous. I would love to have that many pumpkins around. 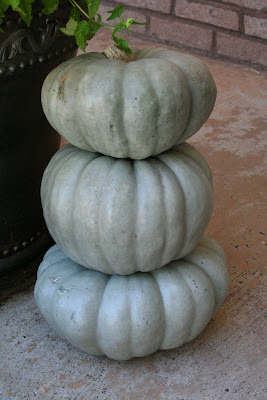 I love the unique pumpkins/gourds/squash-whatever they are. 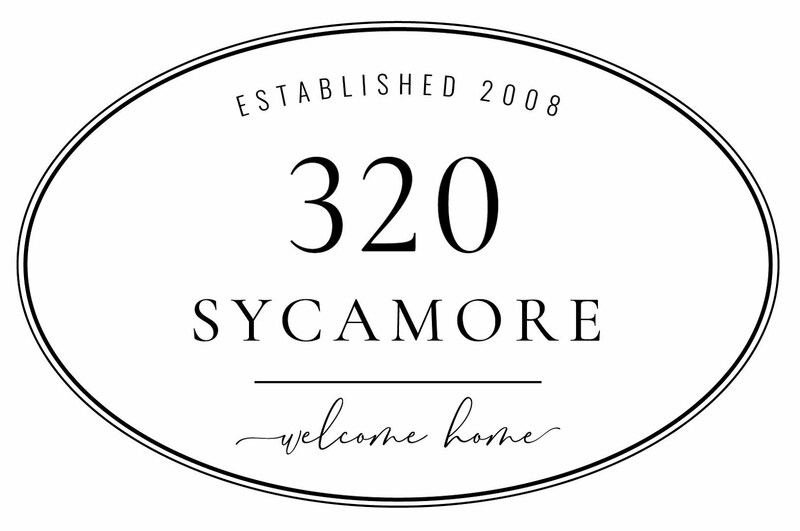 Before we moved from KC last year, I bought 3 unique pumpkins and so glad I did because they didn't have them down here. I had one of those sage green ones, a dark reddish pink orange color, a salmon color and a creamy white (different shape than your friends). Oh wow! that yard looks amazing!! Lucky for her she can get all of those pumpkins!! that can get SO expensive! I got one of those green/blue pumpkins yesterday! I love it!- they didn't have any of the warty ones or white ones though - I need to go some where else - the pumpkins were very slim pickins this year! 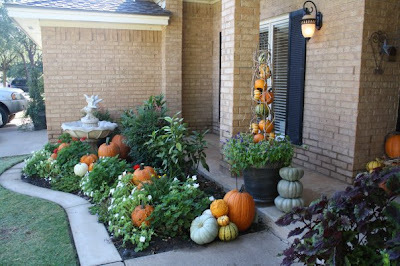 Okay, so I know you aren't supposed to covet, but all those pumpkins are amazing! I love every.single.one. I don't blame you for snapping pictures and I bet your friend is flattered. Her yard looks amazing. Your friend has a beautiful yard. I love all the pumpkins. She is lucky to have such access to them. i love the warty ones too! lol i am decorating too come check out my pumpkin chandlier! That just looks so beautiful and effortless - although I know there was nothing effortless about sticking all those pumpkins in the wire planter. She's got her own little pumpkin patch! 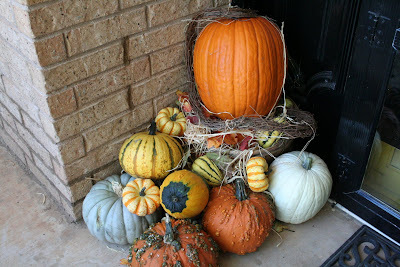 I love Marti's porch and all her different assortment of pumpkins. My favorite are the greenish ones. I'm having a hard time finding them this year. Thanks for sharing her beautiful pumpkin decor. I love decorating for fall. It doesn't have to be expensive. Let nature be the inspiration.